A cloud needs an „physical“ network using real „switching routers“ to transport data between the physical nodes. Each floating pool is implemented using one vlan on the physical network infrastructure. Each flat network requires also one vlan on the physical network. VXLAN requires also one vlan on the physical network. VXLAN adds additional headers (IP and UDP) to packets. You must increase the mtu of the transport VXLAN vlan to a higher value, let’s take 1600. Do not follow the „recommendations“ to reduce the MTU of VMs using the DHCP server. Such a „recommendation“ only leads to big problems in a production environment — do not use a reduced MTU! # They use the same config ! one physical interface for VXLAN transport. This is not true – VXLAN transport requires an IP address in the default network namespace of the operating system. We choose an Openvswitch internal port on the Openvswitch bridge br-uplink and attach an IP address to it. The default MTU must be set to a higher value. We use 1600.
one link to the physical network via br-vlan (or br-eth1 in the Openstack documentation) using a physical interface for the Openstack ML2 „vlan“ type driver. This is not true – we take an Openvswitch patch port as the uplink. 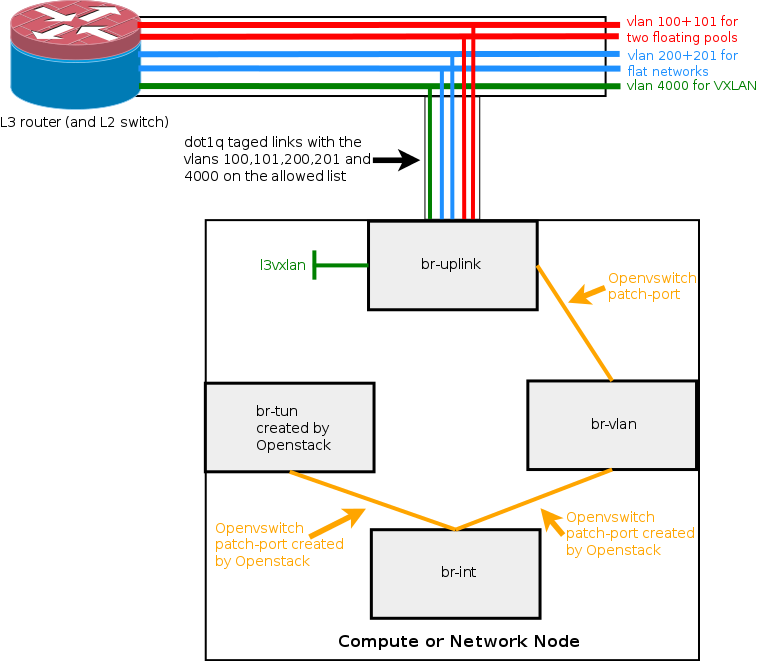 This port connects br-vlan to be use by the Openstack ML2 mechanism driver to br-uplink. two interfaces to map the two floating pools to two L3 agents, each using an Openvswitch bridge, which is connected to the physical network using a physical ethernet interface. This is not true – L3 agents are clever enough to avoid the usage of any additional bridges. And one L3 agent may manage multiple floating pools (or external networks if you are talking „Openstack“). A part of the network configuration must be provided by the admin of the nodes during system startup. This configuration must be placed in the network configuration of the Operating system. The configuration depends on the Linux distribution. Do not enable ip_forwarding on any of the nodes. This is not necessary, even if the Openstack documentation declares this as a prerequisite. Neutron in Openstack Liberty does not require to use br-ex to get a functional L3 agent providing router services. The default setup in the Openstack documentation is using br-ex, but there are other ways to implement networking, e.g. the one shown in this article series.